Sadama Villa, a family-friendly accommodation, is situated between the river and the sea. Sadama Villa has a total of 20 rooms and they are very different. Many of them resemble hotel rooms rather than apartments. Accommodation in hotel the main building, in addition to the two newly-built to offer all the comforts gardenhouse room on the second floor. The first floor is a sauna with pool and fireplace room. Wood-Russian sauna, unique in Parnu, famous for its steam in terms of which are tiresome, but on the contrary, gives to the alertness and vitality. 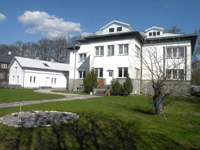 Travelling with children will be in - in popularity, and just be happy to stop on coming to Pärnu Sadama Villa. Villa is surrounded by pleasant apple and pear garden. For children, however, is the latest safe and a spacious game room. The garden is also possible to prepare a barbeque. New promenade together with the children in the square opposite the house leads you directly to the beach! Welcome!